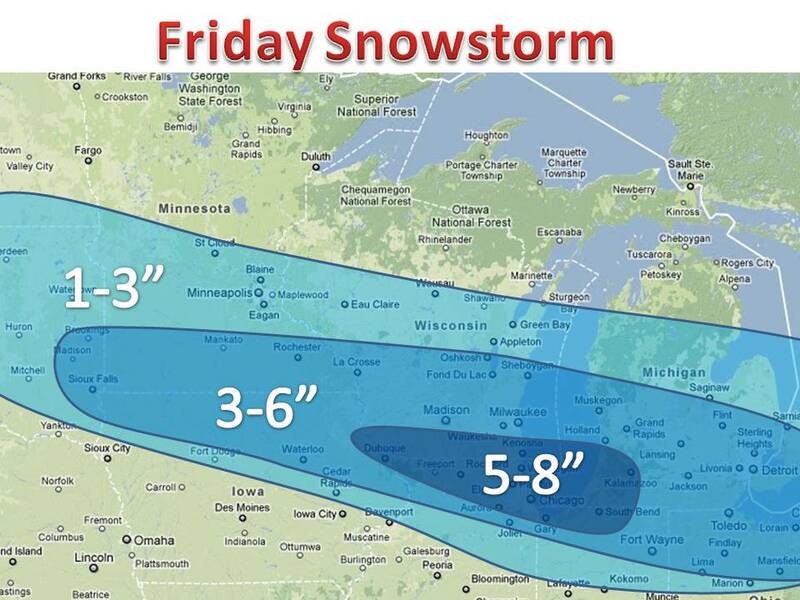 A cold winter storm will strike the Midwest on Friday and Friday night. The snow will develop in the Dakotas and work east and south east throughout the day on Friday and continue into the night for eastern areas. This time around the snow will be very light and fluffy. This will result because of high snow to water ratios, 15:1 to 18:1 for most of the event and many areas north will see ratios reach 20:1 by the end of the event. A normal winter storm brings 10:1 ratios. This storm will produce an isolated band of heavy snow, right now it appears that this band will hit the WI/IL border. The main weather models are coming together, but there are minor differences in amounts and locations of the snow. Never the less, they are in good agreement so confidence is relatively high. This may change ever so slightly so stay tuned to Midwest weather talk! Edit 2:18pm: one of the main computer model (18z NAM) has trended north, something to be watch as the next models role on in. Update around 6:00-7:00 may be needed.